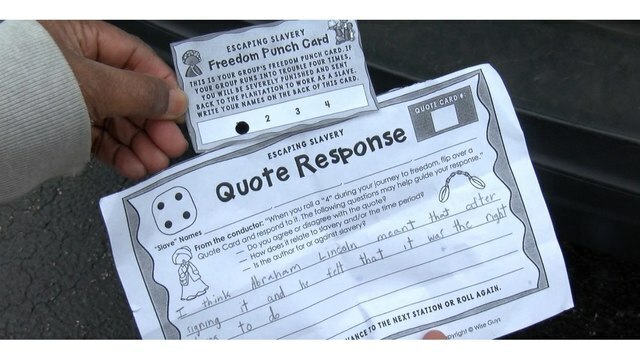 WILMINGTON, N.C. (WECT) - An African-American grandmother is outraged after her granddaughter’s fourth-grade school teacher led the class in a role-playing game that included mentions of shackles, plantations, severe punishment and simulated slaves running toward freedom. Denett, the grandmother, asked to only be identified by her first name because she fears retaliation toward her family or granddaughter. Denett’s granddaughter attends Codington Elementary School in Wilmington, and the child brought home papers from the slavery board game on Monday, Denett said. The Underground Railroad was a secret network of safe houses and people in the United States helping fugitive slaves escape to free states. Her granddaughter told Denett the teacher told students to write their “slave name” on the back of the card. The game papers show cartoon character depictions of slave families and shackles. Denett was visibly upset by the slavery board game and is demanding the school system stop using it to teach children. She said she did not contact the principal or teacher after seeing the game due to concern that her granddaughter would face retaliation. Denett said she believes there are better ways to teach children about slavery. WECT contacted a New Hanover County Schools spokesperson about game, and a school official defended its use. The spokesperson said the Black History Month activity was conducted in small groups with students discussing the activity with the teacher. The overall purpose was to help dispel myths about slavery and help students understand it was a horrible ordeal, according to a spokesperson. In a statement emailed to WECT, Codington Elementary School Principal Graham Elmore wrote that fourth-grade social studies teachers used the “Monopoly-like game” in January, and it was obtained from the educational website Teachers Pay Teachers. The assignment, copyrighted by Wise Guys, Teachers Pay Teachers website. “This activity is by no means intended to disregard the fact that slavery was an inhumane and unnecessary period for so many people,” according to the product description. The board game is part of a larger activity teachers have used for the past two years, according to Elmore. The principal confirmed a card in the game references going back to the plantation, but there was “no emphasis on picking any names,” according to a spokesperson. The unit was conducted to satisfy required NC Social Studies standards, the principal wrote. "As of today, administration and teachers state that no complaints or further questions have been asked to them to learn more about the activity," the principal wrote. Other schools in the U.S. have used different Underground Railroad slavery games that generated outage among parents, including in Virginia and Phoenix. Denett said any game that trivializes the suffering of African-American slaves is unacceptable.